I have a friend who used to own a bookstore, the guy has read everything. 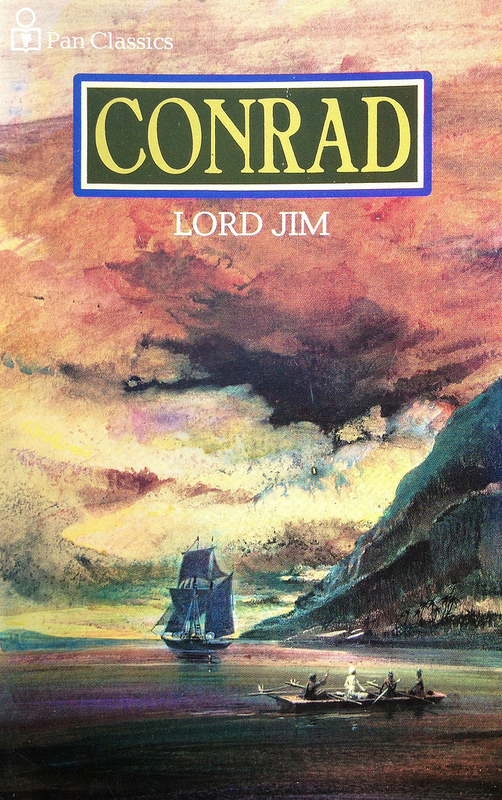 So I’m wandering through Open Books with him and he’s casually remarking on books he’s read and he mentions something about Joseph Conrad’s Lord Jim that makes me want to read it. I can’t remember what he said exactly. He mentioned the word “depressing” in regards to the book and may have said that it’s about a person dealing with guilt. It sounded deep, exploratory. It’s a sad story. Wow. There are few victories and hardly any joyful moments, but it’s very moving. Here’s a synopsis. Jim, a young sailor, had a moment of weakness and abandoned ship with the captain and two other seaman when their vessel, the Patna, appeared to be sinking. The ship never sank. A public trial follows and Jim’s punishment is that he’s forbidden from going to sea again. Jim spends the next few years bouncing around ports working as a ships-chandler’s clerk. He works in a place until someone finds out who he is then he moves on. He’s very good at his job and moves about much to the dismay of his employers. Jim eventually meets Marlow, Conrad’s often used story teller, who becomes enamored with Jim’s story and seeks to help him find some solace. Marlow puts Jim in touch with his friend Stein, who hires Jim to oversee his interests in an island community in Malaysia currently under the wandering eye of an unreliable and dishonest man named Cornelius. This is Jim’s chance to start life anew in a place where his past cannot be dug up very easily. He finds great success and fulfillment in this place. He relieves Cornelius of his duties, befriends and cares for a woman Cornelius was abusing, and rescues the community from the clutches of a local group of bad guys. It’s all going well for a few years, until a group of pirates shows up and starts causing trouble. Cornelius betrays the community by assisting the pirates in an ambush of members of the community, resulting in the murder of the chief’s son, who’s also Jim’s close friend. In a twist of fate, Jim takes the fall for this and the chief shoots him dead. It’s a sad scene, made more touching because the woman, named Jewel I think, begs Jim not to go see the chief because she loves him and she knows he won’t come back. But Jim has no choice, he’s done running, it will not define him. He will face the chief and let fate take its turn. This decision results in his death. Great story. Gosh this moved me. I had a moment of cowardice as a kid that continues to torment me, which we’ll discuss shortly. First, I want to get some great moments in the book documented and so I can reference them in my life. About a third of the way in, Marlow is struck with this thought after an innocuous comment by Jim. 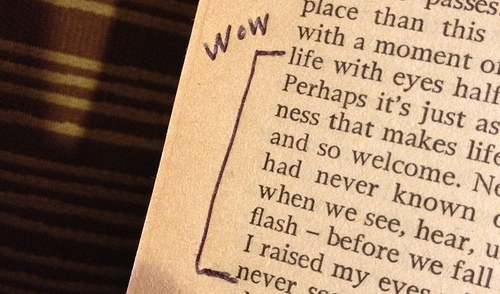 Here’s what I wrote in the margin while reading this. I should have put an exclamation mark. At the half way point, Marlow asks Stein to help him figure out Jim. They arrive at the insight that leads them to help Jim with his new life. It’s such a heartbreaking story, it put me through the wringer. My moment of epic cowardice happened in seventh grade, the first year of middle school in my hometown. It was 1979, and a teacher calls my buddy and I over to tell us a joke. It’s a racist joke that includes the n-word; a white teacher in a nearly all white school telling two white teens a racist joke, in 1979. Not only did I laugh, but I was strangely proud. An adult, a teacher nonetheless, someone I feared and respected, had confided in us and told us a grown-up joke, how cool was that? Why wasn’t I angry? Why wasn’t I revolted? Why didn’t I tell my parents? What was wrong with my makeup as a human being that would cause me to laugh at something so vile? Do I have a dark, uncaring, racist soul? I think about it often and get a sick feeling in my stomach. The episode informs my take on race and equality to this day. I’m not tortured by it, but I recognize it often. This book helped shine some light on it. I’m not sure when my “dormant thoughts” were interrupted with a “rare moment of awakening.” I started to think differently about this at some point and I think it was sometime in my 20s. I don’t recall what series of events caused me to dig this episode up, but I’ve been reliving it for maybe 20 years now. I can’t undo it and make things right, but I can certainly press forward and be sure I don’t repeat the act of cowardice. It’s not “how to get cured, but how to live.” Even on the surface, I have not earned the right to “dismiss it from my mind.” I haven’t done anything significant to stop racism or assist those crippled by it. I’m living with the burden of what I did, half-seeking redemption, if it’s even possible, but more so just wrestling with it. The question remains, what is my responsibility? What do I owe the human race for a cowardly act as a young person? Posted in books, tagged literature on 2013/02/24 by John.